When I made Zombie Mall, I thought a few people might download the game, with fewer still actually going through the process of printing out all of the components and playing a game. While I have no idea how many people have gone through that last effort, I do know that 35 have gone through the trouble of downloading at least 1 of the files for the game from the website. Even more boggling is that half of those downloads are to countries outside of the US. I know those are thanks to links on BoardGameGeek, but how well does what I write translate to Swedish, German, or French? 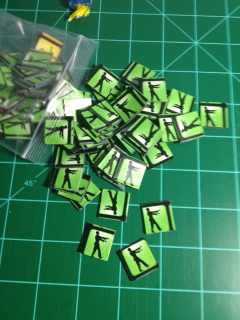 2 months ago I ordered some customized tokens for Zombie Mall. Unfortunately, I was disappointed once I received my order. The tokens were double sided, and the front and backs didn't match up (worse than when I initially tried). The cut lines went outside the bleed area to where the border and part of the next token was often on a token. There were valid reasons for this from the guy I ordered them from, but I would have expected to hear the reasons before he shipped the order to give me a chance to correct any of the problems instead of included in a note with my order. The tokens weren't un-usable, they just weren't as nice as I had hoped. They also didn't feel worth the $40 getting them made + shipping + waiting 2 weeks between order submittable and shipping. I bagged up the tokens and put them in the box with the rest of the game components that have come to make up my version of the game. This weekend I decided to try my hand at making tokens again. Originally I just applied labels to both sides of cardstock (110lb). This worked, but it didn't have the nice weight most people are used to when they pick up a game token. I'd gotten some heavier weight chipboard (just thickly layered cardboard) which had a good weight, so I would try using it instead of the cardstock. After surfing YouTube for a couple of different examples of how people make their own tokens, I had a plan! Step 1 would be how to properly print the tokens. The chipboard was 6"x6", so I would use 1 sheet of label paper and fold it to cover the both sides of the chipboard (before I had tried to line up 2 sheets between the front and back). 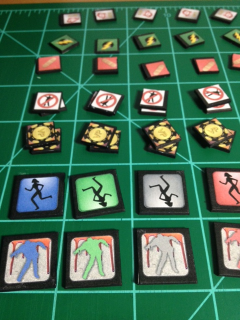 When laying out the tokens, I increased the bleed area and gave each token a thicker black border. After getting the label(s) on the chipboard, Step 2 was to score cut lines with my rotary trimmer. The reason I score the lines is because the trimmer blade isn't deep enough to cut through the chipboard. One of the YouTube tutorials showed a cutter that can handle chipboard, but I started this little project on Friday and had to make do with what I had/could get locally. Plus, $225 for a cutter is one of those things that needs a little thinking about before splurging. Step 3 required a trip to Sears before getting integrated into my process. To actually cut the chipboard (using those scored cut lines from the previous step), my best option was going to be a Craftsman Edge Utility Cutter. Basically this is a large razor blade that cuts like a pair of scissors. The blade fits into the score lines nice and smooth! After cutting out the tokens, Step 4 was to pretty things up with a black Sharpie. One of the tricks of papercraft modeling is to go back over cut/fold lines with a black marker to cover up white paper that gets exposed. Since I was using white chipboard, but the tokens had black borders, marking up the edges of the chipboard would make things look better. In addition, for those times when my black bleed area didn't match up between the front and back, I could use the marker to fill in a little extra border. Once it was over with Saturday night, I had re-made 328 tokens. I'm not sure how long all of this took, but based on the streaming videos I watched from Amazon Saturday I spent at least 5 hours on Saturday making the bulk of the tokens. I had other plans for my Saturday, but for me this turned out to be a nice way to spend the day. Working on game rules & components has become my odd method of relaxation over the past year. 2 months after releasing Zombie Mall onto the world, I've managed to finish what is really the first draft of the rules allowing people to play as zombies. This was something that was originally intended to be in the basic game, in fact it was one of the main ideas that once a person died, they would come back as a zombie. For better or worse, I learned while developing the rules that I really needed to get the basic "how to play as a human" working before I added in "how to play as a zombie". The zombie play has complicated the rules a little, but I think having as solid a set of base rules to work from as I did with the Zombie Mall rules I tried to limit changes to how play existed and focus on the best way to tweak adding on what was needed for zombies. I didn't cut as many corners as I probably would have if I had just tried to do everything in the beginning. Now, of course, I see how going back and re-writing the basic rules to include the zombie player from the start would be easier for the players learning, as well as keep from saying one thing in the early set of rules and adding in an "oh yeah, and" later on. But I don't want to do that right now. I'm ready for another little break from zombies. This leads me to my next project that I've been working on, albeit slowly, for the past month or so. I've gotten more and more interested in Dust Warfare (the game that I got all the models for and never originally intended to play). There are reference cards available online for all of the units. These are nicely done cards, but I would like something a little more customizable - mainly I want to build my forces and have all of the stats on 1 handy piece of paper. With that in mind, I've been going through the rules collecting all the little bits of data I can think that I might need in order to (eventually) populate a database that some magical web app I'll whip up can reference and then spit out what I want. To my surprise, it's actually been a good way to learn some of the rules along with the mechanics of the game. Nerd fun at its finest! 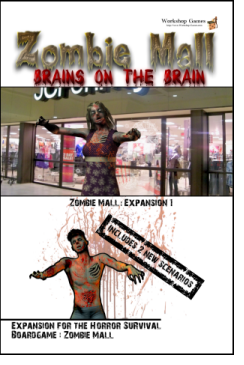 Saturday I got the proof copies of the Zombie Mall rules that I made through CreateSpace. One of the reasons you order proofs is to check the lightness/darkness of images. I had always heard that you want to adjust when making graphics for printing, as looking at things on a (lit) monitor will make images lighter than they will appear in print. On the back cover of my rule books, I've got a faded/semi-transparent image on the top for decoration/to take up what would otherwise be white space. I set the transparency to 35% when making it. What I received is pretty close, but when actually printed out on a glossy cover it looks more like the printer was just running out of ink. Now I've gone back and changed the transparency to 75%, which should offest it enough from the pseudo-wrap-around picture that's on the front and back covers. While I was at it, I noticed I entered the wrong web address on both back covers. My lesson there is to not go surfing to similar web addresses when typing things up! I haven't committed the changes yet, as I think there are a couple of little things I might tweak. Change a little spacing here and there. If I read everything right, these should be showing up on Amazon by the end of the week - unless my tweaking with the covers starts the process over.